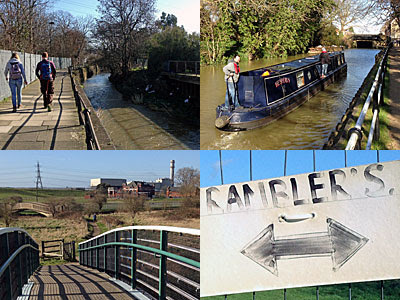 Something unusual happened on the London Loop in Enfield yesterday morning - several people walked it. I noticed at least three couples 'doing' Section 18, all of whom I suspect were on the same train as me out from Tottenham Hale. The first pair were a young couple in purple and grey, each with a separate rucksack, she with a well-thumbed folded-back London Loop guidebook in hand. The second pair were older, she carrying a single bulging backpack, and he with what looked like a proper map. The third pair seemed less certain where to go, relying on printed-out instructions from the Walk London website, and had to ask for help early on to make sure they were on the right track. Hello if any of those were you. I was the one hanging back to take photos, hence you lot all overtook and no doubt reached Chingford long before me. A short distance along the Turkey Brook, just before the arching footbridge, a resident yelled "Have you seen my dog?" from his back garden. Couple number 1 broke off their conversation to admit they hadn't, and were asked by the man to keep a look out as they progressed. I suspect no good news was forthcoming. At Enfield Lock the old pub by the lockkeeper's cottage continues to fall apart, as it seems to have done every time I pass, and is now entirely bereft of roof. The Loop follows the Lea only briefly before breaking off at the Swan and Pike Pool along a short flood relief channel. This detour around the top of the King George's Reservoir is the best spot along the walk for animal-spotting, with sheep and Shetland ponies behind the perimeter fence, and swans and geese flapping along the river through the reeds. A trio of footbridges zigzag the footpath across the water, the third bridge a modern curve raising walkers up for a 360° valley-wide vista. This is also the precise spot where we leave London for Essex. Ahead is Sewardstone Marsh, especially marshy at present, but with a metalled path safely negotiating between any temporary pools. A notice from the Lee Valley Park Authority urges visitors to respect a wire fence erected at great expense to keep the cattle within - PLEASE DO NOT CUT HOLES IN IT. On one bench a cyclist appeared to be sunbathing, except it's February so he wa probably merely asleep. The path emerges into Sewardstone E4, a linear hamlet which is the only place outside London to boast a London postcode. My ten year-old London Loop leaflet suggested there should be a pub on the main road, but all that's visible now is a new-build residential care home with a rebranded inn sign dangling outside. The Loop rises across a squishy field, around a metal barrier signposted with an aberrant apostrophe, then climbs further up a bramble-edged cinder track. The view is getting better as you climb, but only at the top of the straight do the trees subside sufficiently to permit a sightline. Will you look at that? Beyond the two King George reservoirs the entirety of Enfield and Barnet spreads off across the plain, only occasionally dotted with tower blocks, like the quartet at Ponders End. Climb over two stiles to the top of Barn Hill and the extra height extends the panorama. I paused on the grassy flank to stare at North London for as long as it took two horse riders to trot slowly along the bridleway beneath. On the opposite side of the ridge, Essex looked greener, non-urban and more undulating. The path nudges here into the edge of Epping Forest, more clearly seen as a mass of trees in the distance. And then the London Loop does something it occasionally does - the path disappears. The only way forward is to walk along the edge of Bury Road where the verge occasionally narrows to negligible width to negotiate a thicket. On one side of the road a footpath-free golf course is to blame, while on the other the problem is Lord Baden Powell. 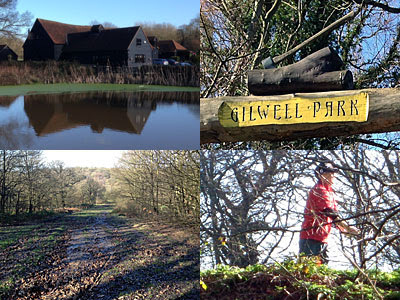 Gilwell Park has been a major Scouting campsite since 1919, and home to several jamborees along the way, but they're not especially keen on non-woggled members of the public gaining too close access. The Loop climbs the main drive, past the car park where coaches disgorge keen and eager patrols and sixes, to a gate topped off by the site's traditional "axe and log" logo. Not far beyond is Scouting UK Headquarters, plus camp circles and umpteen flagpoles, but we're turning left to merely skirt the perimeter. And then the dreaded word 'Bridleway' appeared. Normally we walkers love to share the countryside with folk on horseback, but in England's wettest winter their presence can only mean mud. The path ahead was churned deep, and even the detour to get round the muddy bit was muddy too. Some careful sidesteps helped me to avoid the worst of it but from this point on my boots were turning inexorably browner. As the perimeter fence started to descend I spotted a large unleashed dog ahead so took flight along a path through the trees. Blimey. I'd emerged onto the green slopes of Yardley Hill, and the silhouette of central London was oh so clearly visible in the distance. From the Gherkin/Cheesegrater conglomerate round to Big Ben and the Eye, even the BT Tower, I picked out the major landmarks with ease. And yet the Loop ignores this viewpoint, more's the pity, leading walkers down a lower path with the entire inner London view blocked by trees. I thanked the hellhound for its intrusion, and trod on. And yes, the downward slope was very muddy too. It may look like a featureless straight line on the Loop's official map, but the reality was a steep descent to cross a tiny stream, then a steeper ascent on the other side to ascend towards Hawk Wood. Not surprisingly the lowest section by the stream was the muddiest, including an unavoidable up-to-the-laces squelch before entering a part-water meadow beyond. Exhilarating yes, and I had a real sense of achievement after crossing this woody mini-valley, but I'd be getting funny looks on public transport later thanks to crusty boots and mud-splatter. The ridgetop path was broad enough for me to escape from the muddiest section by nipping between the oaks along the edge of another golf course. All the players here have to wear bright red jerseys for ancient safety reasons, which looks a bit odd, and the course also boasts a very artificial-looking tree that can only be a mobile phone mast. The Loop returns to the Bury Road (watch for traffic!) at the very point where Essex melts back into Waltham Forest. A winter-proof 'horseride' provided much firmer footing, and was being well used by families, joggers and cyclists. That's because this is the corner of Epping Forest closest to the big car park in Chingford, and many NE Londoners had taken the opportunity of a bright sunny Sunday for a swift stroll through the trees. An excellent idea, I'd say, although far better to have hiked from distant Enfield.